How did you start your business? Answers and advice from Creative Founders who have done it. Tell us about starting a creative business, Amy: I started while still working a full time job. I was able to spend the first 2 years figuring out my signature style and creating some of my signature products. I grew small and I’m still growing small. I was able to build up a retail audience and grow wholesale accounts and grow my online audience with a website/social media outlets. My biggest advice is to not rush it. Take your time, keep that job, work late nights and then when the time is right you can take the next step. Tell us about starting a creative business, Bonnie: I started my business right out of college with about $50 and my old laptop! I had no idea how I wanted to use this little business dream to make money, but I did know that I longed to be able to use my skill set to encourage and empower other women to tell their stories well through strong design and heartfelt brand strategy. If I could go back in time and speak words of encouragement to baby boss lady Bonnie, I would tell her to be patient. Starting a business is no easy feat, and it will require more hard work, long hours, trial and error, and fall-flat-on-your-face moments than anything else you’ve experienced. But it’s so worth it! Be kind to yourself as you find your way, because goodness knows you won’t have all the answers. Be humble as you seek out wisdom from others who have gone before you. Be open as you soak up all the knowledge you can from online resources, personal conversations, and educational experiences. And most of all, don’t lose sight of how joyful this process can be! You are building something from the ground up, and isn’t that amazing? Tell us about starting a creative business, Brittany: My current business (Simply for Creatives) was born after I left my corporate banking job to start my own portrait photography business. As my studio grew, I got to know more creatives and realized the financial piece of the puzzle was a big hurdle. Where most cringe at crunching numbers, I love to pour another cup of coffee and dive in. So I started this business to empower small creative business owners with simple tools to help understand your financials and make smart CEO decisions. My biggest tip for starting your small business is do it without taking on debt. Put money aside before you start your business, create a budget and a 6 month plan so you can relieve the guess work of your finances as you get started. Taking on big lumps of debt from the beginning can make starting a business feel like a bigger uphill battle. Tell us about starting a creative business, Caroline: Just start! We can get caught up in wanting everything to be perfect when we launch and it’s never going to be. Just put your work out there and start talking about what you do. Also get your finances in order at the beginning. Have a separate bank account and such for your business. Take it seriously at the beginning and it will grow that way! Tell us about starting a creative business, Jackie: I have two businesses and they each started in slightly (ok, very) different ways. As a stationer focusing on fine wedding stationery, Sincerely, Jackie is my first and primary business. I began designing stationery back in 2008 by entering design contests through Minted and was instantly hooked. Never imagining I could earn a living off of design, I ran my design business as a side project while working full-time in corporate America and going to graduate school. My educational background is in Industrial/Organizational Psychology, which is the psychology of people in working environments. For five years I worked full-time in Talent Development, where I coached future leaders in their interpersonal skills, administered personality assessments to aid leadership growth, and helped prepare the organization for a boom in retirement and turnover. It was a fulfilling, but exhausting career. All the while, I was falling deeply in love with typography, wedding invitation etiquette, fine print methods, and couples getting married; Sincerely, Jackie was thriving and beginning to stretch me to my maximum capacity. When my husband and I began thinking about starting a family, we decided that leaving my full-time job and focusing on Sincerely, Jackie would best serve our family. In 2013 I was sad to leave my full-time career, but thrilled to have the ability to focus only on Sincerely, Jackie and my wedding clients. Having already had my foot in the proverbial door, I found myself in a unique situation to create The Everyday Mother, which has quickly become my passion project. In May of 2016 my husband and I welcomed our beautiful baby boy, Richard Peter. He weighed 2lbs 2oz, was 14 weeks early, and his birth literally saved my life. I developed HELLP Syndrome, an extremely rare, potentially fatal pregnancy complication that can only be cured by delivery. We spent 99 days in the NICU with little Richie, and that’s where The Everyday Mother was born. Unlike Sincerely, Jackie – which was created because I loved design and wanted to find a way to do more of it, The Everyday Mother was created out of sheer necessity. I needed something, couldn’t find it on the market, and decided to create it myself. The Everyday Mother is a printed baby log for tracking daily essentials - feeding, napping, diapers, and even showers for mom (let's be real!). When Richie was in the NICU, I had to keep meticulous notes on my pumping, which is when I discovered there was nothing on the market that I could use. Yes, there were apps, but I needed something I could bring to and from the hospital (where cell phone service was poor). Even more, I wanted it to be BEAUTIFUL, you know, to perk up the oh-so-glamorous task of pumping. I created a simple template that I printed at home, and then shared my template with other mothers in the NICU, who all appreciated it just as much as I did. After leaving the NICU, I had to track even more baby details, so I decided to expand the original template and make it into a beautiful, spiral bound notebook that ALL families could use, NICU or not. With The Everyday Mother, I had originally planned to print a handful of books. It was honestly the minimum order with my printer, just so that I could have the book myself. I sent out an email to friends, family, and some industry peers to see if they could help me at least sell the additional books I had to order. Well, the first print run sold out within a few days, then the second print run ran out, and now I have a second business (and a whole lot to think about) on my hands. Be prepared to work your tail off, and do not expect instant success. Starting a business may look pretty, thanks to social media glorifying it, but the truth is that it is extremely demanding, time consuming, slow to grow, and financially draining in the beginning. The instant-success stories only seem instant because we discover people online after they’ve worked for years – trust me. It took close to five years for me to turn a profit with Sincerely, Jackie. The first few years of business are there for you to build a foundation – network, learn your craft, hone your skill, master your market, study your audience, get a fundamental understanding of the financial aspect of operating a business. It’ll take time and money, but it’ll set you up in the long run. Tell us about starting a creative business, Kelly: I started my business with 20 cents on Etsy. Etsy was a great jump start for me and gave me the confidence, time, and drive, to build a solid foundation for my business. I made a lot of mistakes in the beginning, but that’s why I’m glad I was on Etsy making those mistakes and not spending a ton of money on a shiny new website that I wasn’t ready for yet. My biggest tip for getting up and running is to just start - waiting until it’s perfect isn’t an option because no business is perfect. Tell us about starting a creative business, Kelsey: I started doing freelance design work when I started college, finding clients on Craigslist – not a great idea now! I started an Etsy shop around the same time, selling a wide range of things, though nothing ever really stuck. Eventually I stumbled upon printable planners + organizers out of a personal need I had for a meal planner. I decided to create my own and make them look different than what was already being done. These took off as my freelance work grew, too, and I was able to eventually merge the two into one business that teaches other creatives how to organize, design, and market digital products. 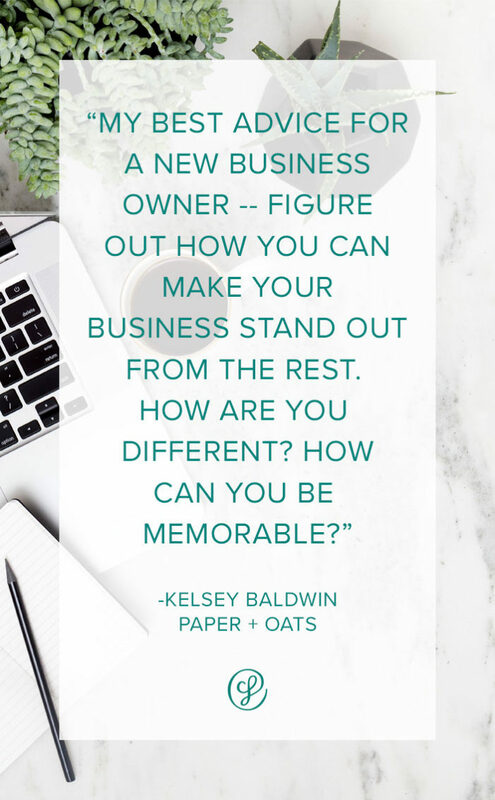 My best advice for a new business owner – figure out how you can make your business stand out from the rest. How are you different? How can you be memorable? Tell us about starting a creative business, Paula: My business came about when I started designing party invitations and party goods for my son’s birthday party. Mostly friends, then word of mouth, more and more people were asking for me to design something for them. I later started doing in-person markets which warranted a non-custom line of products, which have now become my main product line. Looking back, I was pretty unprepared when I started my business. There are a lot of things I wish I had planned out ahead of time - like knowing how much I needed to pay myself and how much I would need to sell to do that. It took me many years to feel comfortable taking money out of my business for myself, but had I not, I definitely would have given up. Now I am getting better about planning, setting and measuring goals (thanks to the SCF Goal Planning Worksheets) which makes paying myself easier and actually allows myself more flexibility because I can stop worrying about all the things in the future and just worry about what’s on my current list. I feel like my story is everyone's story - I started because someone asked me to design something for them and it turned into a business almost by accident. Always dabbling in invitation design, mainly because I have a degree in art with a concentration in graphic & layout design, I was always the "go-to" on volunteer committees and shower hostesses for the invitation. My mother-in-law actually booked my first paying wedding invitation client for me! After designing wedding invitations professionally for 5 years, friends starting asking for advice, I was asked to speak at the Stationery Academy conference, and then started coaching other designers in the stationery and gift industry. My best advice: From the beginning, there was so much to do, so developing solid office hours and work blocks was important with a full time job. Charge what you're worth right out of the gate - so many of us undercharge when we're new. Create processes and workflows so you can work efficiently and develop a good communication plan with your clients. Always be ready for shifts and change - it goes fast in the beginning, so embrace it! Thanks so much for sharing more about starting a creative business. Next month, we'll get their answers on how they discovered their signature style! In the meantime, keep up with all of our creative founders through the links above.